Are you ready for a seaside holiday for sunbathing, swimming and plain ole chilling? Agadir is Morocco’s leading seaside resort with its 10km long beach of fine sand and endless sunshine. Agadir is a never to be missed vacation destination that is suited for individuals, couples and a great place for families to vacation. The seaside coastal road gives a great view of the bay. The old kasbah which was built in the 16th century is now in ruins and offers visitors an incredible view to watch the setting sun over the new town, bay and the port. The Berber traditions are alive in Agadir through its art, souks and ruins and the city has not lost its charm as a family destination over the years. Agadir is in close proximity to other vibrant cities in Morocco, which makes taking a day trip or overnight trip to other towns and cities, such as Taroundant and Essaouira more exciting. Agadir is also a haven for migratory birds that frequent the region. The Souss Massa National Park is a nature reserve and each year a plethora of bald ibises, pink flamingoes and storks colonize the area. The landscape of the Anti-Atlas is swathed with almond trees, palm groves and huge sun-kissed granite boulders. Take the time to get off the beaten track and get on the almond-tree road for a day trip excursion through these magnificent areas that are endemic to Agadir. Agadir is a destination for everyone with its Atlantic coast that is primed for surfing at any level, the beautiful golf courses that are made for 9, 27 and 36 holes, its Berber culture and a destination that brings you back to nature. Families will find Agadir as the perfect place to relax and unwind, yet having enough activities for adults and children for a worry-free vacation. The night life is exciting with restaurants that serve Moroccan cuisine, casinos and discos. The international airport has daily scheduled flights arriving from major cities in Europe and Asia and connecting flights for those arriving from North America. Accommodations range from budget accommodations to 4-star hotels that are all-inclusive and come with the comfort of great food, swimming pools and beautiful gardens. 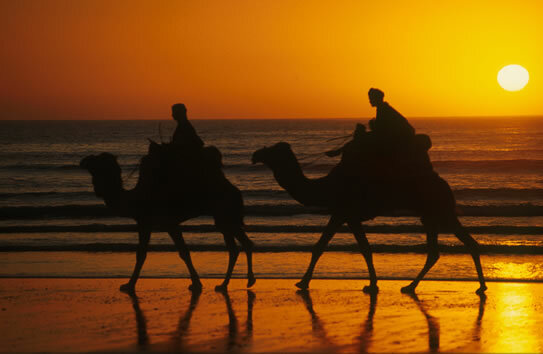 Book with Morocco Why Not today for a great Agadir experience!